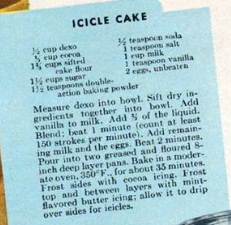 Dying for Chocolate: Icicle Cake: Retro Ad & Recipe! Brr... it's cold outside. Time to make an Icicle Cake! This Retro Advertisement and Recipe is for Dexo, an all purpose hydrogenized vegetable shortening similar to Crisco. "So Blendable. So Dependable."